To date, the most commented blog post on Cycling in Christchurch by far has been our one on the trials of cycle lane separators in the city. The general feedback has been one of strong support for the concept and a wish to see more of them around town. Now some results of the trials from last year can be shown here. Recently the findings were presented at the IPENZ Transportation Conference in Dunedin, which is where transport professionals (engineers, planners, etc) from around the country gather to learn about new developments for traffic/transport in NZ. The study was a joint effort by local consultants ViaStrada, researchers at the University of Canterbury, and the Chch City Council, on behalf of the actual client Ozzie transport agency VicRoads. Video monitoring of the two sites studied was analysed to determine the effects of installing the low “Riley kerbs” and vertical “flexiposts”. Road users (esp. cyclists) were also surveyed to gauge their thoughts about the two trial sites. 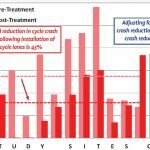 At both sites, the results showed impressive reductions in motor vehicle encroachments following the installation of the separators. The vertical posts in particular had a big effect on preventing poor behaviour and also helped to highlight the low Riley kerbs to approaching road users. The road user surveys were also very positive, with respondents liking the existing setups and also wishing to see them used elsewhere (esp. on busier roads). Interestingly too, women were more likely to be very positive about them, illustrating how separated cycleways of various kinds can be quite crucial to achieving a better gender balance on bikes. Probably the main negative concern was that the Kotare St site felt a bit narrow with the vertical posts installed (the Strickland St cycle lane was widened first and there was no similar concerns). Given the success of the trials, the City Council is now looking at where else in the city to roll these out. Already there is a proposal to replicate the Strickland St separators on the other side of the Brougham St intersection, coming from the north (plus some better hook turn boxes there). The separators were also identified as one of the potential design tools in the new Council Cycleway Design Guide. Copies of the research paper and presentation can be found on ViaStrada’s website. Where would you like to see more of these separators installed? It’s absolutely fantastic to see Chch City Council running real experiments to improve road safety and cyclist perceptions. Setting an excellent example for other cities to follow! Love to see some on Halswell Road on the left heading out of town on the inside of the bend nearest Templetons Road. Cars are always encroaching on the cycle lane there and a few of them don’t even seem to mind that there is a cyclist in them when they do it. It would be really helpful to have one for the lefthand turn from Colombo into Strickland St. Cars coming from Tennyson seem to treat this stretch as a slalom. Slightly better since some of the shops on that side were demolished but they’ll be back. I appreciate that it would be a big ask …. but heading west over the Carlton Mill Bridge onto Harper Ave from Bealey Ave is narrow and cars can get very close . Whilst it is possible to move onto the footpath if you hear a car coming up behind you, there are frequently pedestrians coming toward you with frightened looks on their faces . The footpath spanning the bridge is quite narrow . Going the opposite direction after leaving the share path through Hagley Park is another dicey route . Short of getting off and going across 2 sets of pedestrian lights to get onto Bealey Ave racetrack in the right direction, the other option is to use the southside footpath counterflow to the traffic , which brings you to another problem once at the Victoria St intersection . Option 3 is to stay in the park , cross the foot bridge , cross Park Terrace and use Salisbury and Montreal Streets . Neither of the 3 options are particularly pleasant . How about some at the chicane on Dyers Rd between Maces Rd and Wickham St. This area has a high kerb so you have no way out of trouble when 2 trucks go through and try and fit beside the cyclist. A real dangerous spot which will kill somebody one of these days. Kotare Street (and most other streets in Christchurch) should have at least the kerbs on every corner, in particular where it turns into Kahu Road. The number of cars cutting around corners inside the bike lane is just astonishing. A miracle no cyclist has yet been killed on that stretch, especially considering how many school kids use that road. Previous Previous post: Time for a Ciclovía in Christchurch?